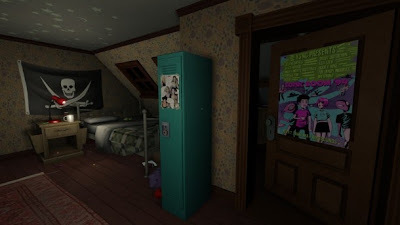 Gone Home, the first game by Portland, Oregon indie studio the Fullbright Company, has been mildly successful. Even the New York Times has written about this game. But please don't read any of that. Don't read this review. The best way to experience Gone Home is with a clean slate, not knowing anything about it going in. I'll attempt to convey my thoughts on the game while spoiling as little of the plot as possible. 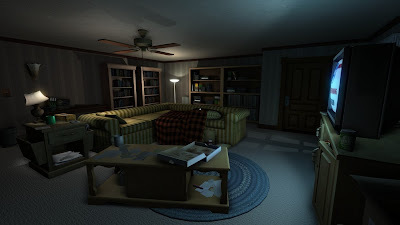 Gone Home is an interactive story in the vein of Dear Esther. Evoking classic children's stories like The Lion, the Witch and the Wardrobe and Coraline, Gone Home is about exploring a creepy mansion. It's not quite a horror game, but it teeters on the edge of becoming one: creaking floorboards, secret passageways, and of course, a dark and stormy night outside. You play as a college-age girl who's returned home to Oregon after a trip backpacking around Europe. Your family moved to a new house while you were gone, so you're unfamiliar with the imposing mansion you've come home to. Your flight was late, so you arrive in the middle of the night... and no one's home. There's a handwritten note taped to the front door from your younger sister, Sam, telling you she's gone and "Please, please don't go digging around trying to find out where I am." Of course, this is the natural videogame impetus to do exactly that. Gone Home is all about digging around. The gameplay of Gone Home is fairly simple. It's more interactive than Dear Esther, but there's no combat or puzzle-solving (aside from solving the mystery of the story). Its bread and butter is environmental storytelling. You explore the abandoned house, rummage through cabinets and closets, and try to figure out what happened to your family. Almost everything in the house is rendered in full, so you can pick them up and read the nutritional facts on a cereal box in the kitchen or the liner notes of a cassette tape in your sister's bedroom. Gone Home is set in 1995, and the developers have paid immaculate attention to detail when it comes to the period setting. VHS tapes, posters of '90s punk bands, giant phones with answering machines. Tons of little details strewn throughout the house lead you to discover the stories of your family members. Your mom is a park ranger who may be having an extramarital affair. Your dad is a failed science fiction novelist who's resorted to writing reviews of stereo systems for a consumer magazine. The house once belonged to a relative who may or may not have committed suicide. But front and center is the story of your sister Sam. While you were the A+ student in the family, Sam was the socially maladjusted one. And as you explore the house, you hear narration from Sam. It starts off a bit heavy-handed, but as it goes on, Sam's voiceover narration is beautifully performed. It's a double-edged sword, though: with how effective her narration is, it diminishes the stories of your other family members because none of them get voiceovers. I'd rather have had zero narration and simply pieced together Sam's story the same way I pieced together everyone else's. Gone Home is almost meditative. You're taking a quiet journey through a beautifully rendered empty mansion. It's not quite a haunted house. There's a sense of voyeurism to it all, looking through things you were never meant to see. The developers were inspired by Japanese haikyo, abandoned family homes left with all their photo albums and family heirlooms left intact. But it's got horror overtones. The whole time I played (late at night with headphones on, naturally) I was expecting something to jump out and scare the poop out of my pants. Because so much of the gameplay involves slowly examining everything in every room, the opportunity for jump scares is palpable. The secret passageways and creaky floorboards make you constantly think there's someone lurking behind you. Perhaps that's testament to how immersive Gone Home is. Gone Home tells a poignant tale of family. Each family member has a story to be discovered in the house, and each is tragic in their own way. It's also one of those rare games with a female protagonist and complex female supporting characters, exploring homosexuality and the '90s riot grrrl movement. Sam's story is the most fleshed out and gets the most attention, which is great, but it slightly diminishes the stories of the other family members. The father in particular has a gripping story that could get overlooked by some players. But maybe that's the point. 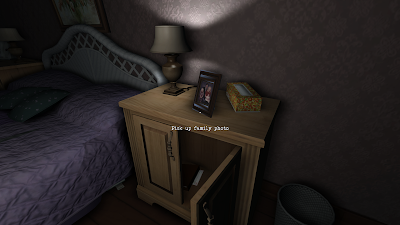 Gone Home is all about discovering the little details. At $20, Gone Home may be a bit pricey for roughly three hours of gameplay. If you didn't enjoy Dear Esther, you may want to wait until Gone Home goes on sale. But for anyone who appreciates the more unconventional art games, Gone Home is a must buy. It's my favorite game of 2013 so far, and a landmark in videogame storytelling. Gone Home is currently available on PC, Mac, and Linux.